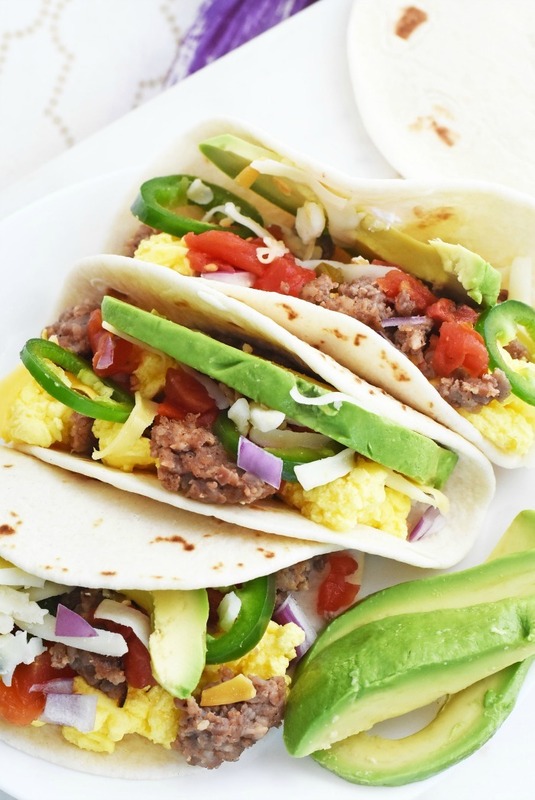 Breakfast Tacos combine the best of both worlds and make an excellent brunch idea. 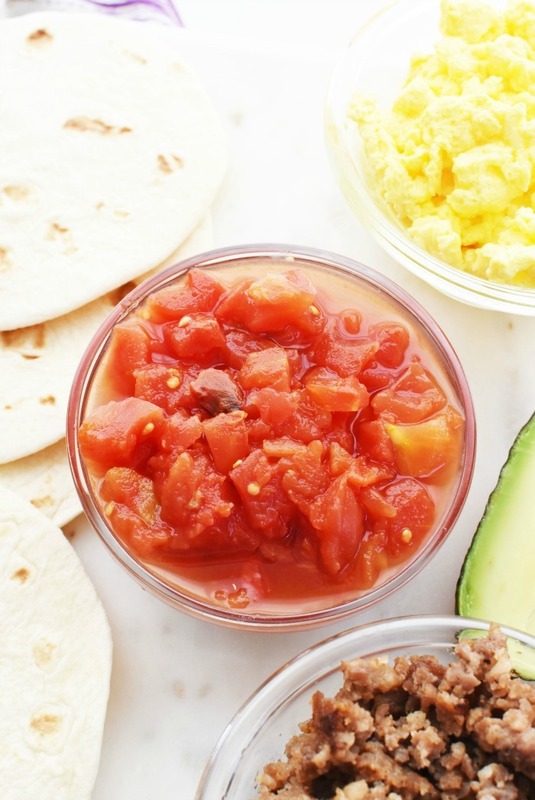 Your guests can easily make their own tacos with a breakfast taco bar. This post is sponsored by Mirum. All views are that of our own. Tacos are life around here. But, when you combine tacos + breakfast magical “brunch” things happen. 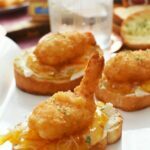 Things that make your foodie taste buds jump for joy! I mean, tacos for breakfast/brunch on Easter? Sign me up please! I am so ready to dig in! Have you ever tried a breakfast taco before? I know I sure have and lets just say it was love at first bite! Just imagine savory, mild ground sausage, tangy tomato + chiles, creamy cheese, fluffy eggs, sweet red onion, and avocado. 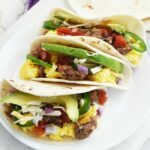 If this all sounds delicious to you, then you need to make these easy Breakfast tacos for your brunch peeps. Or, you could also make it a taco bar where they have to assemble their own! Tacos can be so versatile, but I am so excited to share the combination that will have you winning over your guests. 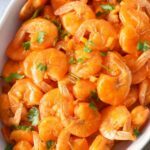 They feature ingredients that are easy to find at Walmart, simple, and fresh. 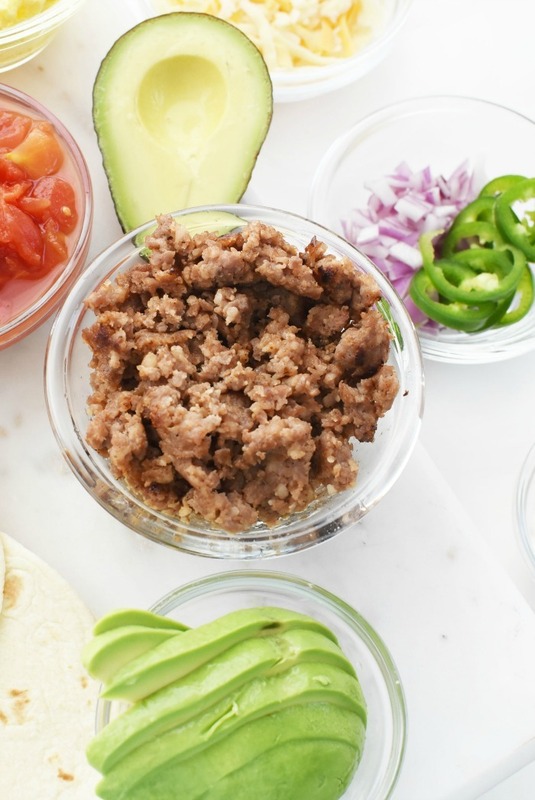 In fact, you can even prep the taco toppings ahead of time for a quick brunch! To make breakfast tacos ahead of time, simply make/prepare all your ingredients ahead of time and then place them in an airtight container. I prepared the eggs, sausage, onion, and jalapeno earlier in the day and was able to heat up the eggs and sausage quickly before enjoying. RO*TEL Original Diced Tomatoes and Green Chilies 10 oz. We really love using ground sausage from brands like Odom’s Tennessee Pride for our breakfast tacos. 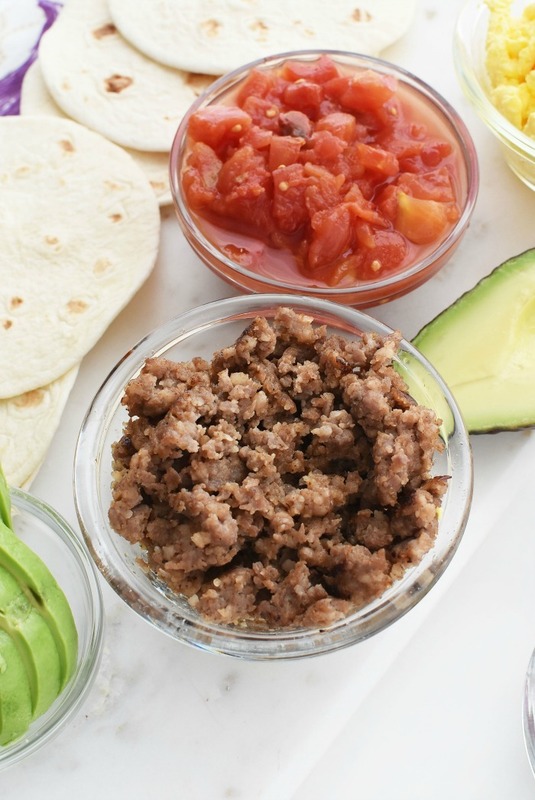 It is made with perfectly spiced, premium pork and is similar in texture to traditional taco meat. 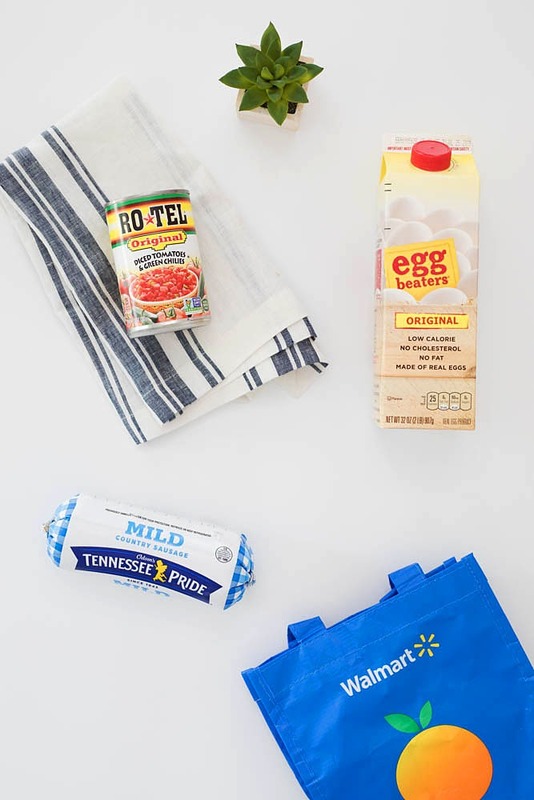 Plus, this brand has just 200 calories per serving and 9 grams of protein. Using brands like RO*TEL are perfect for breakfast tacos because it is not only less work and quick, but the flavors are banging! I love how RO*TEL brings the BOLD flavor fast–with just a flip of the lid! RO*TEL is made with vine-ripened tomatoes, and zesty green chilies, with a mix of spices that gives it an adventurous taste. Have you tried this product? It is amazing!! Quick tip: If you are serving your tacos right away, drain the excess juices, if not save them and serve with a slotted spoon. My favorite eggs for my breakfast tacos recipe happens to be Egg Beaters. The Original 32-ounce size is perfect for making the fluffiest scrambled eggs ever for a small crowd! 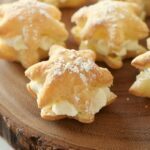 Made with 99% egg whites, Egg Beaters eggs are seasoned with beta-carotene, and contain extra vitamins and minerals naturally found in egg yolks. Additionally, They even heat well which is excellent for breakfast tacos. 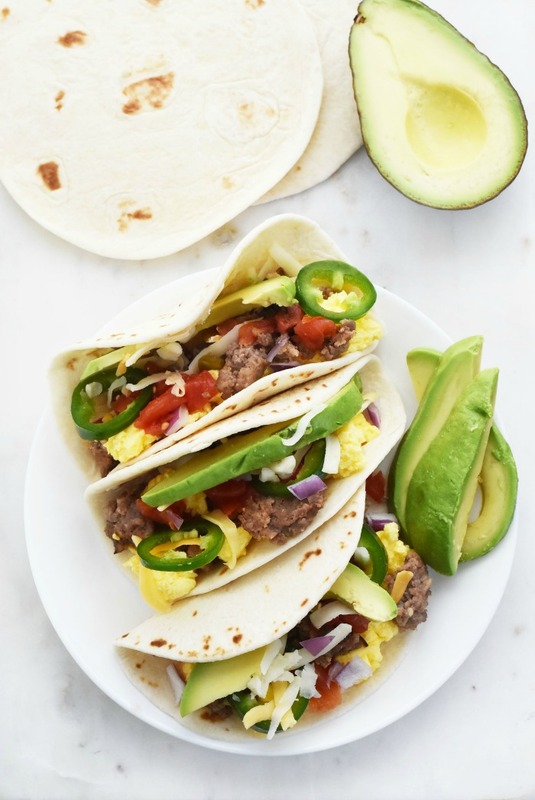 Get our Breakfast Tacos Printable Recipe Below! 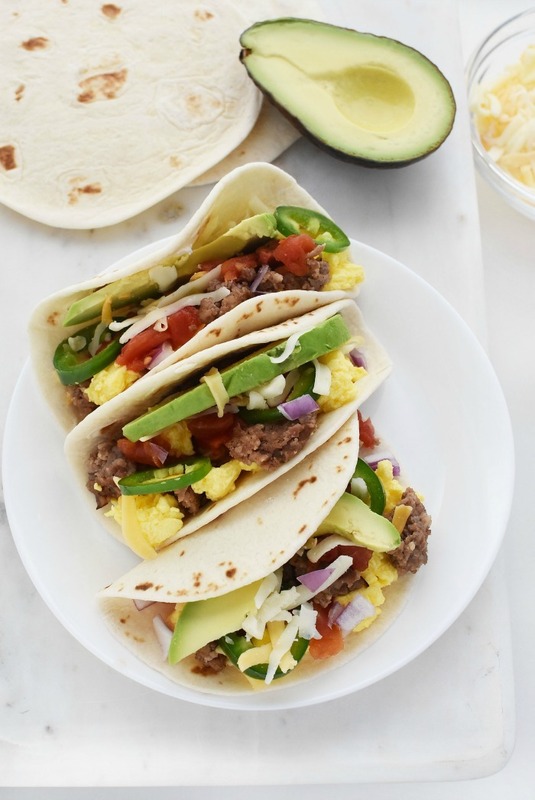 Breakfast Tacos combine the best of both worlds and make an excellent brunch idea. 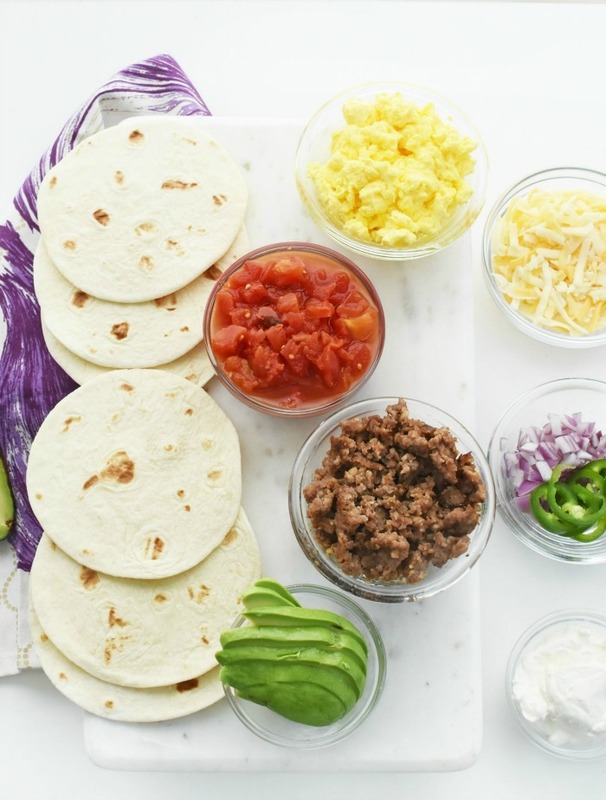 Your guests can easily make their own tacos with a breakfast taco bar. In a skillet, brown sausage until fully cooked; set aside. Cook Egg Beaters until light and fluffy; set aside. Drain RO*TEL if you plan on assembling the tacos right away, if you are preparing, save juice and serve with a slotted spoon. If you are setting up a taco bar, add all toppings to dishes and cover. To assemble a taco add an even amount of sausage meat, eggs, avocado, red onion, cheese, jalapeno and sour cream. Tacos for breakfast is pure genius! I think I’m going to start making these every Tuesday. Our Taco Tuesday is going to start and end with tacos! It’s going to be lit, as the kids say. Now these are looking super good. The avocado and the nice spice from the jalapenos must go so well with the sausage. I am SUCH a taco lover. Equal opportunity taco lover – all types, all shapes, all shells, all seasons, all times of day. Lol. And I like these – so many breakfast tacos are more burrito style, with everything scrambled up together. And the slices of avocado look SO delish right now!! I am obsessed with tacos and forgot I could have them for breakfast! 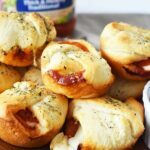 This is an easy and delicious idea for breakfast! I am usually in a hurry in the morning, but you made these sound so doable. Thanks for the yummy goodness. I am off to print this recipe. I could eat tacos at any time of day. 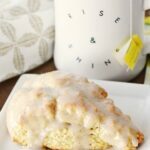 I’d love to try your breakfast version! These remind me of our recent vacation to the southwest, I miss breakfast like that. Now with your idea I can make it at home! My family can eat tacos all day and every day. I will have to try this version out. The perfect way to start the day! 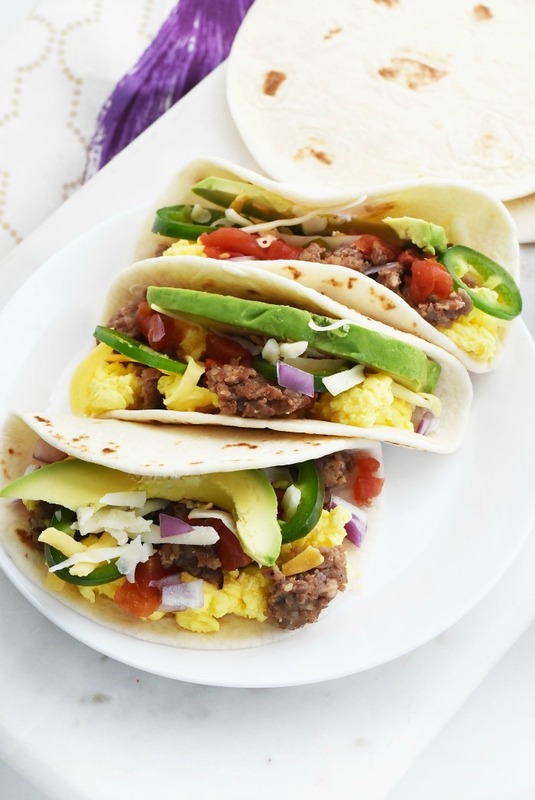 These tacos are exactly what we need for brunch today! This breakfast tacos look so delicious! I think the whole fam would love this and request it frequently. I need these breakfast tacos in my life! They look so good. I am sure my family will love them.